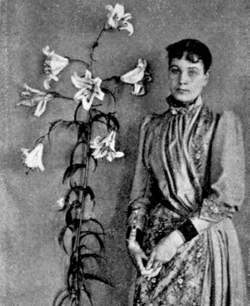 Objects, both living and inanimate, that are caused to appear during séances are called “apports.” The lilies in this photograph, for example, were said to have originated in the spirit world.Fortean Picture Library. Apports are objects that suddenly appear (materialize) in Spiritualist séances whose origin is attributed to the action of spirits. In some cases they are attributed to the spirits having materialized an object de novo and other times to their transporting the object from a remote location. In the later case, the object may actually belong to one of the sitters at the séance. Through the early twentieth century, the appearance of apports was a popular feature of Spiritualist séances, and considerable energy was expended on theoretical speculations on the conditions that would support the reality of such objects. The theorizing became more complicated when living objects, flowers being among the most common, began to appear. In the early twentieth century, as scrutiny of mediums by psychical researchers became common, many tried to understand the phenomenon of apports, but increasingly, as fraud rose to the top as the most likely explanation, observers tightened the conditions under which mediums operated. Initially, apport frauds were discovered inadvertently, as was the case with Australian Charles Bailey, who at Grenoble, France, in 1910, produced two live birds during a séance. He was unaware that the dealer from whom he obtained the birds would be among those present at the séance. Through the twentieth century, a number of Bailey’s fellow mediums were found to be operating fraudulently, and the appearances of apports declined markedly. Today it is assumed that the production of apports by mediums would break a variety of natural laws, and that none have demonstrated their manifestation under test conditions. The production of apports in a séance would thus be a direct evidence of trickery. Among the most recent exposés of mediumistic fraud relative to apports was made by former medium Lamar Keene in the 1970s. He discussed the manner in which he produced apports by stage magic, often taking small objects from the homes of prospective sitters, only to return the objects during a séance. Keene, Lamar. Psychic Mafia. New York: St. Martin’s Press, 1976. Price, Harry. “The Mechanics of Spiritualism.” Posted at http://www.survivalafterdeath.org/articles/price/spiritualism.htm#apports. Accessed April 1, 2007. 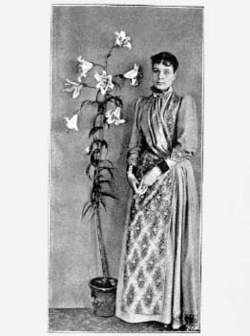 Photograph of a golden lily, which appeared at a séance in June, 1890. Courtesy Fortean Picture Library. The word is from the French apporter, meaning “to bring.” In Spiritualism, an apport is something that has been brought into the séance room by a spirit—usually the spirit guide of the medium. It appears “out of thin air” and is sometimes initially hot to the touch. The explanation is that the object has dematerialized, been transported (or “teleported”) through space, and then rematerialized in the séance room. Some apports suddenly appear on the table in the middle of the circle of sitters. Some actually materialize in the hands of one or more of the sitters. Some materialize in the trumpet, if there is one, and are then tipped out of either the bell end or the mouthpiece end. Interestingly, Maurice Barbanell, the psychic investigator, spoke of some apports appearing this way and added that although they were tipped out of the small mouthpiece end of the trumpet, the objects were actually larger than the diameter of that end. The apport itself can be anything. Small precious and semiprecious stones are common, but it could be a piece of jewelry, a vase, a book, or even a living thing such as a flower, bird, or small animal. (In the case of Eusapia Paladino, she once apported a dead rat!) In fact apports are not restricted to small items. There is a wonderful story of the two mediums Charles Williams and Frank Herne who specialized in apport séances. They were giving a séance and someone jokingly suggested that they should apport the famous medium Mrs. Agnes Guppy, who lived only a short distance from their séance room in High Holborn, London. This suggestion was greeted with laughter since Mrs. Guppy was a very large woman. But within a matter of minutes, a very large figure suddenly appeared, with a thump, on the top of the table. It was Mrs. Guppy, wearing a dressing gown, holding a pen wet with ink, and looking very startled. Frank Podmore (Modern Spiritualism, 1902) repeats an account that appeared in the Echo of June 8, 1871, written by one of the sitters at the séance, which says “From the joking remark about bringing Mrs. G. to the time that she was on the table three minutes did not elapse. The possibility of her being concealed in the room is as absurd as the idea of her acting in collusion with the media.” W. H. Harrison, the man who had originally suggested her for an apport, together with another of the sitters, escorted Mrs. Guppy the two miles back to her home. There they found that the servants could attest to the fact that one minute Mrs. Guppy had been sitting in her study doing the household accounts, and the next she had disappeared. In fact her friend Miss Neyland had been in the room with her, reading a newspaper. When she happened to look up she found that Mrs. Guppy had disappeared, leaving a slight haze near the ceiling. Mr. Guppy, on being told that his wife had disappeared, commented that the spirits must have taken her and went off to eat his supper! He was about eighty years old at the time. White Hawk, the guide of medium Kathleen Barkel, frequently had apport “parties,” as he called them. He thought they were a lot of fun, and the sitters usually agreed with him. At one of Barkel’s séances, a ring materialized between the cupped hands of Maurice Barbanell. When he examined it, he found it to be a plain nine-carat gold ring with the words Per ardua ad astra—B engraved on the inside. White Hawk explained that the ring came from the late author Dennis Bradley. Barbanell immediately recognized that Per ardua ad astra—meaning “through difficulties towards the stars”—was the motto of the Royal Air Force, in which Bradley had served. Also, Bradley’s first book about Spiritualism had been titled Towards the Stars. The letter B was appropriate both for Bradley and for Barbanell. The Australian medium known as Charles Bailey, through his guide Abdul, apported such items as live fish, crabs and turtles, live birds sitting on eggs in their nests, rare antiques and coins, a stone from beneath the sea still dripping with salt water, a human skull, and ancient clay cylinders with Babylonian inscriptions. Many apports produced by Bailey, for his sponsor Thomas Welton Stanford, are now to be seen at the Leland Stanford University in California. On occasion Bailey was suspected of fraud, though he usually was able to explain away any ambiguities. The famous medium Estelle Roberts, and her guide Red Cloud, also produced apports. Kenneth Evett, Roberts’s son-in-law, once asked if he might receive an apport from Egypt. Red Cloud agreed. Some time later, after a large number of the sitters had received apports, Evett got his wish. It was a beautiful scarab talisman edged with gold. Red Cloud said it came from Abydos, though Evett was unfamiliar with the place name. Later he took the scarab to the British Museum to get an expert’s opinion on it. He was told it was indeed a genuine specimen, and was typical of the scarabs from Abydos. One of the best known apport mediums was “Madame d’Esperance” (Elizabeth Hope), whose spirit guide was a young girl named Yolande. At one séance Yolande presented her medium with a huge golden lily, as tall as the medium herself. This was similar to an apport produced at one of Mrs. Guppy’s sittings when a friend of the naturalist Alfred Russel Wallace asked for a sunflower. No sooner had he done so than a huge, six-foot specimen, with clumps of earth still clinging to it, thumped down on the séance table. Ce barrage a enregistre des apports de 137 millions de m3 cette annee, alors que la moyenne annuelle est de 625 millions de m3, a ajoute le responsable, dans une declaration a l'agence TAP. La necessite de tabler sur la recherche scientifique pour assurer le maintien de cet arbre et son evolution sur des bases scientifiques et methodiques, devient incontournable pour la sauvegarde de cette vegetation aux apports nutritifs, cosmetiques et medicinaux. Il existe alors un risque de persistance de la polyurie, par des apports excessifs a visee compensatrice[sup. L'exposition lors de la grossesse et pour les enfants en bas age est donc un sujet particulierement sensible, et c'est precisement chez ces groupes de population que nous manquons de donnees sur les apports alimentaires. Malgre sa richesse, il ne pretend pas ecrire une prehistoire de la revolution historiographique que fut l'entreprise de Marc Bloch et Lucien Febvre, mais va bien au-dela et entend preciser quels furent les apports et enrichissements reciproques que s'offrirent l'histoire et la sociologie en ce long tournant de siecle, qui construisirent par la meme le statut epistemologique qui fut le leur tout au long du vingtieme qui s'esquissait. S'agissant des regions du Nord Ouest, la oo existent les grands barrages de la Tunisie, " les apports ont ete tres faibles, et inferieurs aux moyennes de la periode. Au programme de la manifestation, une exposition des differentes varietes de la figue de Barbarie et les produits fabriques a partir de ce fruit epineux connu pour son bon gout et ses apports nutritifs pour la sante ainsi que d'autres objets de l'artisanat qu'animeront les participants au rendez-vous, a-t-on signale. Une rencontre organisee le 11 mars 2008 au theatre national Mohammed V, dans le cadre de la premiere edition du Festival du theatre de Chellah, avait mis en lumiere son parcours authentique et ses apports multidimensionnels a la scene artistique national. Mestiri recommande la consommation davantage de poissons, au moins 2 fois par semaines, au vu des apports nutritifs de ces produits riches, notamment, en omega 3 et en omega 6. Tri, conditionnement, stockage des matriaux recyclables issus des collectes slectives en porte porte ou/et en apports volontaires accueil nocturne (entre 4 heures et 7 heures). Les precipitations du week-end dernier ont eu pour effet de regenerer les apports en eau de tous les bassins, retenues collinaires et nappes phreatiques, plus particulierement le barrage de Taksebt, dont le niveau etait au plus bas. Mais cependant, le melange avec le sel ou le sucre change ses apports, autant que la teneur en calories.